Reading and share top 2 Robert Masello famous quotes and sayings. 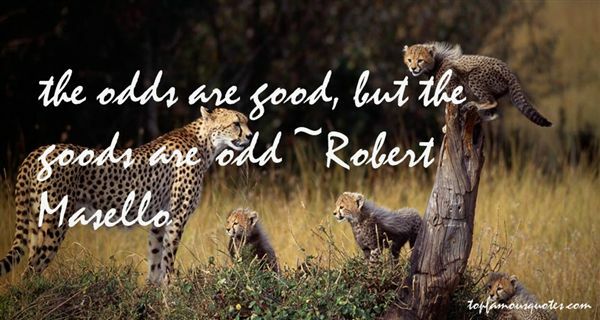 Browse top 2 most favorite famous quotes and sayings by Robert Masello. You're right [Joshua], I have taught you nothing. I could teach you nothing. Everything that you needed to know was already there. You simply needed the word for it. Some need Kali and Shiva to destroy the world so they may see past the illusion to divinity in them, others need Krishna to drive them to the place where they may perceive what is eternal in them. Others may perceive the Divine Spark in themselves only by realizing through enlightenment that the spark resides in all things, and in that they find kinship. But because the Divine Spark resides in all, does not mean that all will discover it. Your dharma is not to learn, Joshua, but to teach. ""How will I teach my people about the Divine Spark?"... "You must only find the right word. The Divine Spark is infinite, the path to find it is not. The beginning of the path is the word."